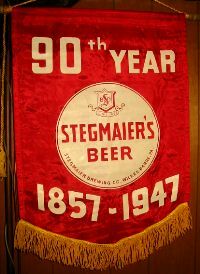 I think, 1950’s vintage large silk banner probably used mainly by distributors and possibly fair or festival beer gardens. This is a large one that measures 45 x 25 inches. 90th year silk banner from 1947. This one measures 17 x 25 inches. A vey sharp looking banner. Notice the center graphics is much like some of the coasters and tap knobs of the era. Delivery person hat cover used in foul weather to protect the more expensive hat of the same design. The tag inside indicates it’s from the Unitog Company of Warrensburg, MO. 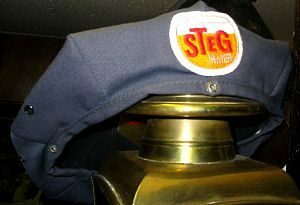 and states Higest Quality Industrial Uniforms. Note the patch is a fairly scarce one that I suspect may be 1950’s vintage.